The Tibetan people’s unique way of traditional living is deeply reflected in their dance. Perhaps the most characteristic feature of this dance style is the body’s forward tilt, accompanied by an incessant bouncing originating from the knees. This rhythm accompanies nearly every movement and stems from the daily custom of carrying water long distances from mountainous rivers to their homes. 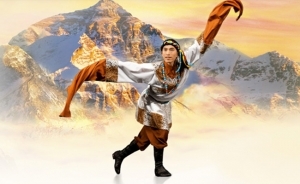 Tibetan dance also has the unique trait of often extending the arm and the leg of one side simultaneously, rather than in the alternating fashion of walking. This, too, harks back to the difficulties of treacherous climbs in the Himalayas—to more efficiently travel on slanted mountain roads, the Tibetan people will carry their load on one side of the body, allowing them to save energy on their daily journeys. Tibetan dances, especially the male ones, are also known for their energetic techniques. These include vigorous jumps and turns, all performed with the characteristic high-heeled boots.